Hi! 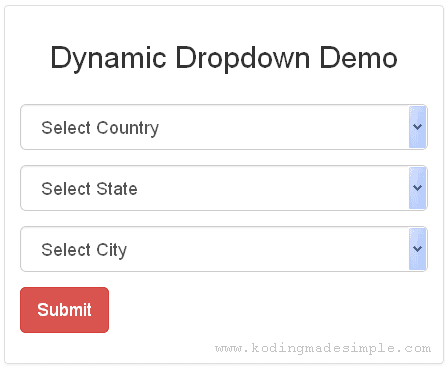 Today we'll see how to create country state city drop down list using jquery, ajax, php & mysql. Sometime back I shared a tutorial on building dynamic dependent select box using ajax and codeigniter. And I got enquiries from readers about implementing similar thing with php. So I thought it would be better to write separate tutorial about creating dynamic dependent select box in php without the complex MVC structure. Though the underlying concept would be same, implementing dynamic dropdown list in core php is way different from than in MVC like Codeigniter. 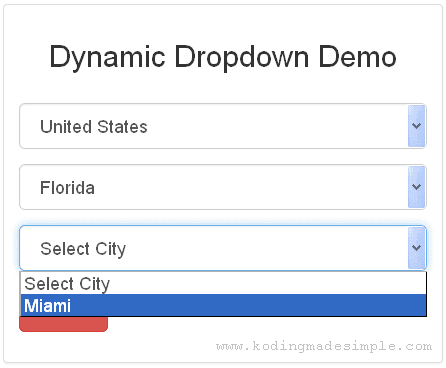 I'm going to take the same country state city dropdown list example and explain the process here. The process goes like this. We have three drop down lists on a php form each one for 'country', 'state' & 'city' respectively. On page load 'country' dropdown alone will be populated with country names from mysql db. On choosing a country, the 'state' dropdown will be filled with state names based on country. Similarly selecting a state will populate relative city names in the 'city' dropdown box. The entire process will be handled via ajax call without refreshing the page. This file handles database connectivity from php server. Here I have used PDO & prepared statements for database communication as it's more secure and portable. This is the server script that communicates with mysql db and populates dropdowns with data. This file is called through ajax() function. It retrieves state and city details from database based on the chosen 'country_id' and 'state_id' resp. and returns them to ajax call which in turn populates the drop down lists. Done! We have the required database and coding files in place. Now run index.php and you can see a form populated with country dropdown. Now choose a country to load corresponding states in the state drop down via ajax. And a state to load respective cities in the city dropdown list. And you can see the entire process happening in a discreet way without page refresh thanks to Ajax. That explains about creating country state city dropdown list in php & ajax. Please let me know if you have any queries through comments. it's awesome tutorial..thanks bro, but i was qustion. Hi! Glad you liked it. Here I have used mysql db. If you plan to use SQL just make the connectivity changes and the same logic would work. I'm glad I discovered this website. The tutorials are awesome and well explained. I tried this example and I displayed the name of the seleted value under the form. If possible, I would like to know what changes should be made to keep the selected values in the dropdown boxes after pressing the submit button. If i hadn't visited this post, how would i have known that the Country State City Dropdown List using jQuery, Ajax & PHP? I am very glad that i had the time and chance to visit this post, a page that is very interesting and informative. We are here to help you understand the Importance of Analyzing Data using SPSS Software. with the link we have provided, there is much more you could discover.